Hanoi (VNA) - The Dinh Vu Polyester Fibre Plant is scheduled to restart production soon after a prolonged suspension of operations. The Vietnam National Oil and Gas Group (PetroVietnam), holding 75 percent of the capital at the 325-million USD plant, held a meeting recently with the Vietnam National Textile and Garment Group (Vinatex) to discuss a fibre consumption solution for the plant. Vinatex Chairman Tran Quang Nghi said that the fibre consumption of the plant was not only a matter of cooperation, but also of responsibility. Vinatex has always affirmed its support for the plant by consuming its fibre products. 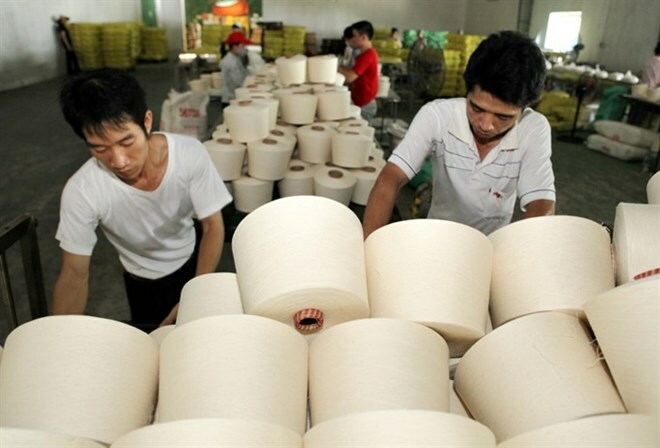 Vinatex general director Le Tien Truong said that the demand for the polyester fibre of Vietnamese enterprises had been growing 10 percent to 15 percent annually. It had a consistent steady growth rate in the past few years. Depending on the cotton prices in the world market, the demand for polyester for spinning may increase or decrease, but the percentage of demand between cotton and polyester is stable at about 60/40, respectively. Currently, Vietnam needs to import some 700,000 tonnes of cotton per year and about 400,000 tonnes of polyester fibre. In 2015 and 2016, with the steady investment by foreign companies in the domestic yarn industry, the country had about 7 million spindles, double the numbers in 2015. On the other hand, fibre prices have ranged from 1,100 USD to 1,120 USD per tonne, 200 USD higher than the fibre prices in 2015. Meanwhile, the cost of material for producing polyester fibre was also lower than the price of material in 2015. "These are important considerations in determining the time for recovering operations at the Dinh Vu Polyester Fibre Plant," Truong said. He also affirmed that Vinatex would increase the volume of polyester fibre products bought from the plant to 100 percent from the current level, or at least by 50 percent according to its commitment in the past, if the plant ensures quality and stability, and fulfils the commitments on payment and delivery as in 2014 and 2015. Vinatex and the Vietnam Textile and Garment Institute will continue to support the plant to control the quality of its products and design units to test the fibre at the weaving and dyeing stages. PetroVietnam’s General Director Nguyen Vu Truong Son also pledged to restart operations of the plant as soon as possible and ensure the stability of polyester fibre supply to local enterprises. PetroVietnam has proposed to the Prime Minister the possible measures to recover the production of the plant. Meanwhile, Vinatex will provide information about consumption for PetroVietnam to determine the best plan for re-operation of the plant.